Experian has released a new ad to promote its CreditMatch feature, which uses your preferences and FICO score to match you with the right cards. 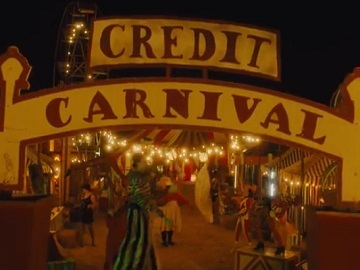 The spot, titled “Credit Carnival,” opens with a ringmaster welcoming a couple to the Credit Carnival. They are informed there are “ambiguous credit card amenities” and advised to use their rewards for a “luxury lakeside vacation” that turns out to be a shack by the water where an old woman lives with her cats. The voiceover says that, with Experian CreditMatch, based on your preferences and your FICO score, you will get matched to rewards cards that apply to you. CreditMatch applies your FICO Score, which is calculated based on FICO Score 8 model. Your lender or insurer may use a different FICO Score than FICO Score 8, or another type of credit score altogether.